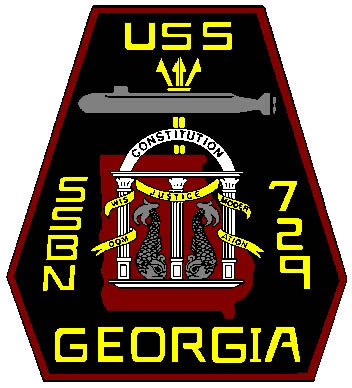 USS GEORGIA (SSBN 729) is the fourth Ohio class nuclear powered fleet ballistic missile submarine and the third ship to bear the name of this grand state, one of the thirteen original states of the Union. The keel laying ceremony was presided over by First Lady Rosalyn Carter, wife of President Jimmy Carter, both Georgia natives. 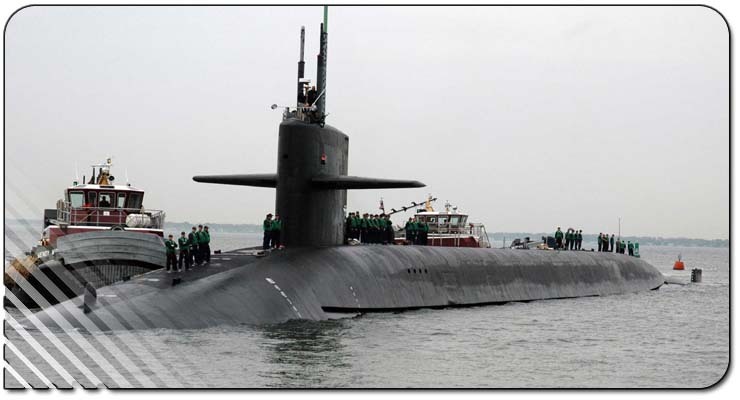 The ceremony took place the same day that the USS OHIO, the lead ship of the class, was launched. Mrs. Carter's initials can still be seen on the ship's keel. On November 5th, 1982, GEORGIA was launched and christened by Mrs. Sheila Watkins, wife of Admiral J.D. Watkins, USN, Chief of Naval Operations. On 11 February, 1984, USS GEORGIA was commissioned at Naval Underwater Sound Center. Commissioning Officer was Admiral James D. Watkins, Chief of Naval Operations. The following major events have marked the ship's history. - March to April 1984 shakedown and TRIDENT C-4 missile launch. - November 1984 ship arrived at homeport Bangor, Washington. - January 1985 first strategic patrol. - First Meritorious Unit Commendation as an element of TASK UNIT 14.7.1 from September 1983 to May 1986. - Second Meritorious Unit Commendation for Submarine Operations from February 1986 to August 1986. - Conducted first ever Pacific Fleet SSBN Follow on CINC Evaluation Test conducted in the Atlantic Fleet from February to March 1994.